Clark University’s Adam Institute for Urban Teaching and School Practice hosted the seventh annual meeting of the Urban Teacher Education Consortium, March 5-7. 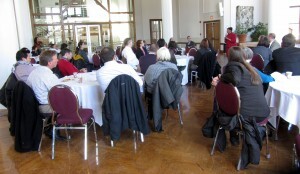 In attendance were more than 50 participants from colleges and universities from the Northeast, Midwest and California. The consortium was coordinated by the Adam Institute, the University of Chicago Urban Teacher Education Program, Mills College School of Education (Oakland, Calif.), and Long Island University (Brookline, N.Y.) to develop powerful urban-teacher preparation programs through on-site investigations of practice, joint problem-solving, and research. The conference treated participants to visits at two urban schools at different stages of development: Dudley Street Neighborhood Charter School in Roxbury, Mass., and Claremont Academy, which borders Clark’s campus. The former is in the process of creating itself from the ground up, one grade at a time, in partnership with the Dudley Street Neighborhood Initiative and the Boston Teacher Residency, an organization that provides prospective urban-school teachers with a year of intense, classroom-based preparation. Claremont Academy, an underperforming public school serving grades 7-12, has recently partnered with the Adam Institute and Clark’s Hiatt Center for Urban Education to implement an academic and college-going learning culture. Conference attendees were introduced to the Clark-Claremont partnership and given an opportunity to view teacher rounds, a practice developed by Institute director Tom Del Preteand described in his 2013 book “Teacher Rounds: A Guide to Collaborative Learning in and from Practice.” Groups of Clark education faculty, Master of Arts in Teaching students, and educators from Claremont Academy hosted discussions on topics like professional learning practice, Clark’s M.A.T. program, and collaborative research. Del Prete describes the conference as an opportunity to highlight the Adam Institute’s teacher-education practices and partnership with local schools, and also to gather input from other urban teacher educators. Education faculty from Clark and its partner schools will meet to reflect on the ideas and suggestions that came out of the conference. “Being a host site gives us an opportunity to draw people into our practice and help them understand it, and also to get thoughtful observations and feedback on the work we’re doing,” he says. The conference also provided a meeting opportunity for members of an ad hoc group formed at last year’s Chicago conference to explore the possibility of undertaking cross-site research on urban-teacher development. Clark’s Mosakowski Institute for Public Enterprise provided start-up money for the group, which includes representatives from the Adam Institute and Hiatt Center.